Saddle up! 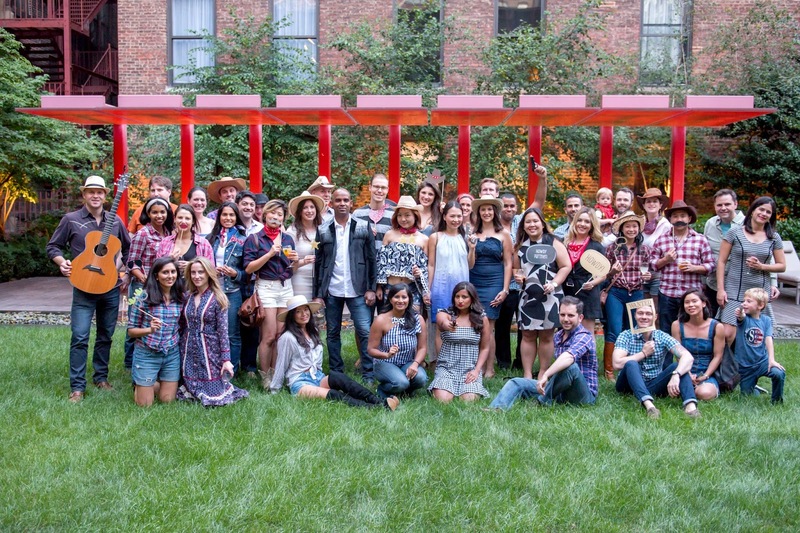 This year we celebrated the big 36 with a fabulous country-western party! The guest list included cowboys, cowgirls, sheriffs and even some outlaws! This theme even coordinated with our intimate birthday dinner at Black Barn in July. We are excited to share our Country Hoedown with you. We used Splash to customize the perfect Country themed invitation. Splash distributes online invitations (think Evite, Paperless Post and Punchbowl), manages contact lists (think MailChimp), sells tickets (think Eventbrite), and creates a page to showcase the postparty photos (think Flickr). You can find our original invitation here. We incorporated several rustic elements to create our Western Saloon. Our color palette featured neutral browns and whites with pops of vibrant reds and yellows. We scattered red bandanas, horses and cowboy hats around the room. We used Punky Prep’s Western printables. The collection featured horses, horseshoes and country themed signs. Olga from International Garden created our adorable floral arrangements. Guests “trotted on in” to our Welcome Table, which was decorated with a beautiful bouquet of yellow mums, auburn alstroemeria and tan gems. We placed a spectacular cowboy hat arrangement of sunflowers, red roses, auburn alstroemeria and berries on the coffee tables. We scattered plastic horses and hurricanes with red gems around the room. Guests were asked to unleash their inner cowboy or cowgirl. Guests dressed in plaid, gingham, denim, cowboy boots, bandanas and hats. They looked fabulous! The Country Western menu featured classic Southern dishes: biscuits, cornbread, mac and cheese, gauamole, salsa and pimento dip. Special thanks to The Cakeboard Catering Group for making the delicious biscuits and cornbread. We had attended their tasting event a few weeks earlier. We also served Burgers and Hotdogs. We used Punky Prep’s food tents. We recommend food tents for non-formal parties as they can be both decorative and informative. We recommend a well styled bar that coordinates with the theme or color palette of the party. We decorated our “watering hole” with brown linens, red bandanas, sunflower arrangements and red/brown chevron napkins. We believe every party should have at least one signature cocktail. Guests had their choice of peach mojitos and spiked lemonade. We also served bourbon and red, white and rosé wine. The twins kicked off the festivities with a champagne toast with Nicolas Feuillatte champagne. Guests loved our chic and stylish dessert table. The key to create a stunning dessert display is utilizing platters and vases in a variety of sizes, heights, shapes and widths. We recommend sticking largely to white serving dishes as colorful desserts photograph beautifully against them. We used a barn backdrop from Huayiphoto to create the perfect country inspired dessert table. We used a burlap tablecloth and scattered red bandanas to add pops of color. We placed sunflower arrangements on the corners of the dessert table along with votive candles and plastic horses. The table centerpiece consisted of chocolate candy favors in the shape of horses, cowboy boots and cowboy hats. We placed an arrangement with yellow mums in front of the chocolate centerpiece. Archana baked two flavors of mini cupcakes: chocolate pecan and hummingbird. She decorated the treats with mini chocolate boots and horses. We also served homemade bourbon balls and fresh strawberries. We recommend adding Photo Booth backdrops and props to every themed party. While purchases from Etsy will easily run in the $100 range, the memories you make with them will be worth so much more. We loved this saloon backdrop from Huayiphoto. Our friend, Mark, performed several country classics for our guests. He was spectacular! Thanks to all the cowboys and cowgirls who celebrated with us!